A Mudworm's Thoughts » Blog Archive » MTB: COE!!! 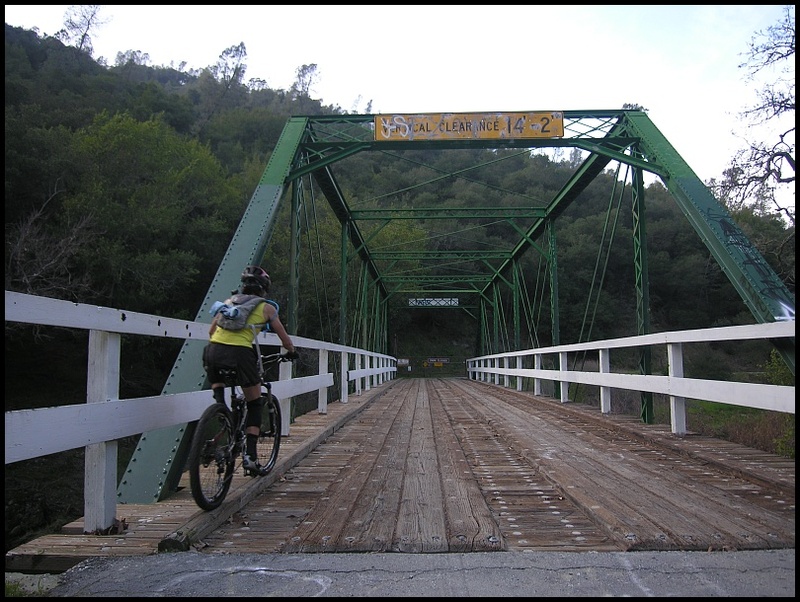 Ever since I broken a pedal on my first and only hooky ride at Henry Coe, I had been wary about repeating it. But I had to do it today, a Thursday, aka a work day, for a few reasons: 1) the reason that I a demo bike with me was because I told the bike rep that for me to buy a bike, I had to take it to an ultimate test at Henry Coe first; 2) The weather was moving in on Friday; 3) my vacation time was about to max out again. Charlie (aka Skyline35), Greg (aka locoyokel), and Eric (aka the dude I was asking about) joined me. I knew I was in for a fun day. At 9am, the sun already hit the Hunting Hollow parking lot, and it was pleasant, so much so that I took my jacket off. Poor Charlie. He panicked in this unseasonal warmth and cried, "I don't need to bundle up. I don't know what to do now!" The route we took was roughly: Hunting Hollow parking lot -> R: Gilroy Hot Springs Road -> Coit Road -> R: Serpentine -> R: Timm Trail -> R: Coit Road -> R: Anza -> R: Jackson -> Elderberry Sprint Trail -> L: Jackson Road -> R: Wasno Road -> Kelly Lake -> Kelly Cabin Canyon Trail -> Cross Canyon Trail -> R: Grapevine -> L: Anza -> Coit Road -> Skinny on Gilroy Hot Springs bridge -> Gilroy Hot Springs Road -> Hunting Hollow parking lot (23.9 mi / 4560') If anyone is looking for a fun route at Henry Coe with a lot of singletrack but not too much punishment (not that there is anything wrong with that), I strongly recommend this route. This was my first time riding with Eric. Very soon into our ride, I discovered that he had an obsession — he was obsessed with cleaning trash and clearing loose debris and hazards off of the trails. He made frequent stops, but pedaling efficiently on his hard tail, he was leading the way most of the time. I confess I had my own obsession as well — when I was on a climb, I just could not stop, at least not until I was about to tip over. So, it was a repeated scene on today's ride that Eric stopped to saw off some hanging branches or remove some fallen debris, and I would ride up to him and pass right on by without stopping. I sometimes did say, "Thanks, dude!" Well, an obsession is an obsession. What can you do about it? Actually, despite our route being fairly short (by the Coe standard), we spent quite a few hours out there because: 1) guys could talk, and 2) they did quite a bit impromptu trail work along the way. I couldn't help but feeling inspired, so I kicked a few little rocks off of the trail at one point. 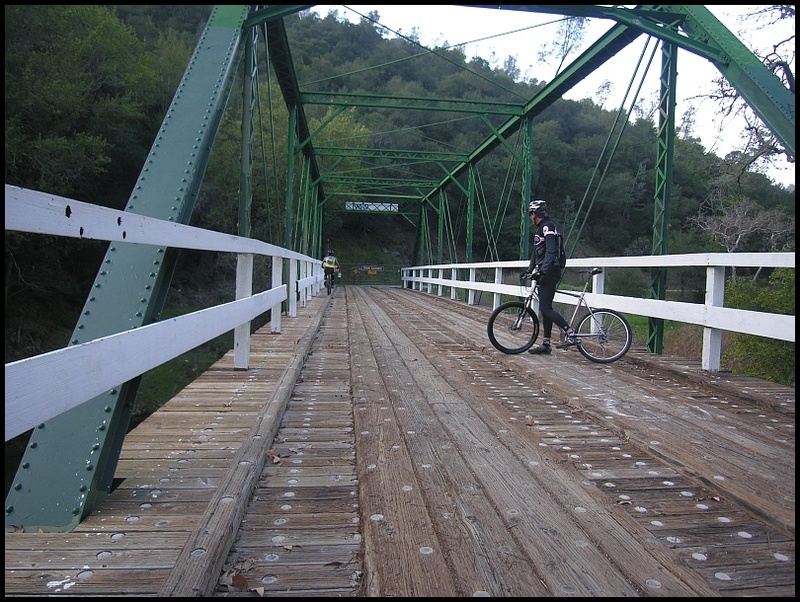 Ever since I saw Charlie's picture of Brian/knobs riding the skinny on Gilroy Hot Springs bridge (link), I had been interested in checking it out. Actually, on the later part of the ride, I was quite fixated on playing on the skinny and made sure my wish was heard by the guys. Finally, we were there. I jumped right on it, and then, I fell right off of it. No biggie, because there was no real danger there, well, except when I almost fell into the barbwire fence leading to the bridge when I failed to mount the bike. Charlie commented with a big smile, "Nice job!" and Eric and Greg laughed. Hey, were the guys laughing at me? That would have totally bruised my self-esteem. But on my best run, I managed to stay on the skinny and rode on and on and on (it felt like forever) and finally fell off of it maybe about 20' before the very end (I think it was more because of excitement). I rode back out with my head held high toward the thundering claps from the cheering crowd. If I had been able to take my hands off of the bar and punch into the sky without falling over, I would have done it. Well, I'd better keep my post short so I could beat Charlie to it. My pictures pale in comparison to his. But Charlie's fans, do not hold your hope too high. I don't think I saw him with his camera out much on the ride. At one point, we even asked, "Should you go ahead? We'll wait for a few seconds and then ride in single file by you, so you can take pictures." He hesitated and replied something like, well, the sun was not right, and I think he might even said something about the gentle breeze being in the wrong direction or something. Excuses, excuses. I couldn't help but wondering if we were not photogenic enough for him. There was an exception though. When we were playing on the skinny, I urged Charlie to give it a try. He held on to his dear camera and replied, "No~~~~~, I'm taking pictures!" Oh, did I say I should keep my post short? Remember how helpless Charlie felt in front of boulders? Eric and Greg decided to do something about it. Can you tell which picture of Greg was taken at the beginning of the ride, which at the end? Charlie greets from Henry Coe. Eric in his tick suit. Great time indeed. On the bike, I'll have a separate post on that. Staying tuned. I got my vacation all paid out when Oracle bought Sun so I start with nothing.. no hooky rides for a while :( But very happy to live vicariously through your blog! Looks like a fun day! Is that Greg Barnes??? Nice, the man, myth and legend. Looks like an awesome day!